From our counselors: Week Seven has gone by in a flash! Only one-week left, it’s gone so fast; everything is still going well, though. 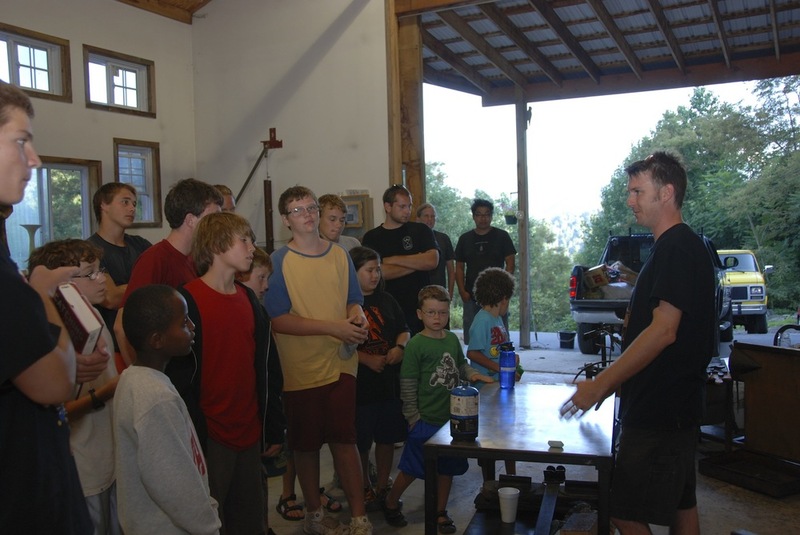 The campers are all still having fun, new activities this week have included the boys being shown glass-blowing and getting to make paper weights, the girls get the same treat next week! Outdoors has seen practice pitching of tents, in preparation for camping at Linville Falls this weekend. Art has been split up this week, with the first half focusing on photography and the second half saw the return of paste paper, as next week our newer campers are making binders. Woodshop has seen various projects, including the conversion of previously made cars into boats, an interesting task. Both tutoring and typing have both been gong well and much effort is being made. The weekend was it’s usual jam packed self, with the campers going to Linville Falls for the second time to camp on Friday night. This including all the traditional camping activities; cooking food on a fire, the campfire, and even a search and rescue demonstration! Saturday morning saw the second attempt at fishing, this one was also a success. Sunday was equally active, with the campers heading to Crabtree Falls, another waterfall off the Blue Ridge Parkway. The falls were beautiful and the campers had a great time exploring round them. After lunch everyone headed back to Bakersville for Gem Mining! Which led to a collection of very pretty stones being found by all the campers. All in all a lovely weekend. Now a word from one of our campers-who shall remain nameless but she's been here all eight weeks! We are coming up to our finally week of camp! This past weekend the kids that were 12+ went rafting on the Nollichucky River. We all had a blast. Only 2 people fell out of the raft , but they got right back and and continued down the river. While the older kids went rafting the younger kids went tubing on the same Tow River and they all had a blast too. After dinner we went down to Bakersville soccer field and played soccer,but some of the kids went on a nice walk in the park. After a long game of soccer we went out for ice-cream. On Sunday we went to Wilson's Creek it was a little overcast but warm. We had a short hike, and then got to the creek that was amazing. This week we have been preparing for the Pirate Olympics that is going to take place next week. In swimming the kids have enjoyed doing relay races and learning to dive. In woodshop we are making boats for the boat race. In art we have been doing sun prints with True, and now we are doing paste paper with Luc. In outdoors be have been doing paintball, pitching tents for camping, playing little games in the field and rock climbing. A lot of our outdoor classes have been doing creek hikes. Newer PostWeek 8 . . . and that's a wrap! Older PostWeek Six and Beyond!